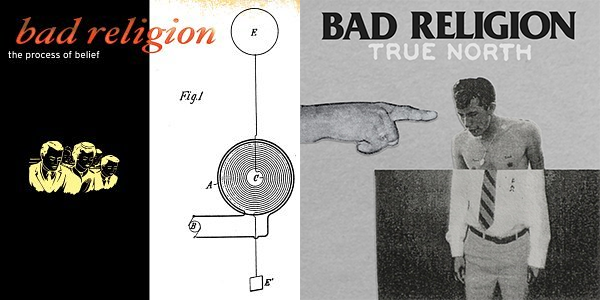 Bad Religion's "The Process of Belief" and "True North" turns 17 and 6 years old, respectively, happy birthday! "The Process Of Belief" is the twelfth studio album by the American punk rock band Bad Religion. It was produced by its leaders Greg Graffin and Brett Gurewitz, and was released on January 22, 2002 through Epitaph Records. After touring in support of its previous full-length studio album, The New America (2000), Gurewitz rejoined Bad Religion in 2001 after a seven-year hiatus. The band re-signed with Epitaph, and then began work on its first album for the label in over eight years. The album also marked the first album to feature Brooks Wackerman, who replaced former drummer Bobby Schayer. "True North" is the sixteenth studio album by the California punk rock band Bad Religion, which was released on January 22, 2013. After touring in support of their previous album The Dissent of Man (2010), Bad Religion began writing new material for an album that was planned for release in 2012.